On his 21st birthday, the awesome and terrible powers of the Darkness awaken within Jackie Estacado, a mafia hitman for the Franchetti crime family. Jackie must learn to fully command the Darkness so he can take back control of the Franchetti family, which is ruled by his uncle Paulie, a despicable man who is almost universally despised. Though his supernatural entity lets him wreak terrible havoc on his enemies, The Darkness also has a strong will of its own. Jackie must learn to control The Darkness that lurks within him while harnessing its power to overthrow Paulie and fulfill his Destiny. 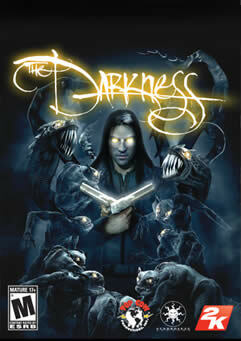 •Based on the comic book “The Darkness”, created by Top Cow. •Game story written in collaboration with acclaimed comic-book author, Paul Jenkins. •Experience extremely intense cinematic action in this gritty, first-person, action-adventure game with a horror twist: you are the horror! •Varying manifestations of the Darkness allow you to devour, impale or implode your enemies. •Cannibalize the corpses of your slain victims and transform them into Darklings â€“ impish and hilarious demonites that commit unspeakable acts. •The absence of light feeds and replenishes the Darkness so seek the shadows wherever possible. •Fight your way through the dark and seedy underbelly of New York City as well as the ethereal realm of the Darkness. •Play as Darklings in online multiplayer games and face other players in traditional multiplayer modes as well as all-new innovative game modes.